The cocktail party was in its heyday a few decades ago. From the casual, "Stop by for a drink before supper; come as you are" to the formal "written-invitation, little-black-dress" affair, friends gathered together for cocktails. These gatherings required (in addition to actual cocktail ingredients) chips-and-dips or hors d'oevres and special serving accessories, such as glasses, shakers, trays and linens. Small linens, called cocktail napkins, were created to suit the occasion.  Varied or whimsical designs encouraged a bit of ice-breaking conversation. Modern disposible paper napkins are convenient; vintage cocktail napkins are intriguing. A set of vintage cocktail napkins may add a memorable note to your next party. But more than that, it may be the start of a lifetime collection. Size, price and variety make cocktail napkins a wonderful collectible. A humungous collection wouldn't fill a dresser drawer. You may not even require a matched "set" to begin or add to your collection; a single vintage napkin can represent the design. Sized to hold a few little nibbles or delicately wipe a fingertip or two, cocktail napkins range from 5" to 8"; round, square, rectangular or cut to a specific shape, such a pansy or elephant; linen or cotton. At first glance a single vintage cocktail napkin may be mistaken for an oddly-shaped hanky or little doily. Commercially produced napkins were sold in sets of four, six, eight and twelve. Two preferred vintage makers are Marghab and Leacock. 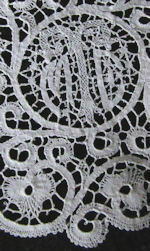 Many cocktail napkins were made in Madeira, a small island off the coast of Portugal, known for fine embroidery. Pale-blue floss and tiny seed dots characterize Madeira-made cocktail napkins. Since even used sets tended to be stored in their original cardboard boxes, you have a good chance of identification, possibly even a loose paper label inside. Both commercial and homemade sets frequently displayed different variations of a theme on each napkin. Many are handmade, truly one-of-a-kind, some further individualized by a monogram. Smaller pieces, 2 1/2" to 3", are cocktail coasters. Some coasters are double-layered, forming pockets, into which the stem of the cocktail goblet is inserted; so that the coaster will be there wherever the cocktail is placed. Some vintage sets held matching cocktail napkins and coasters; some a larger under-piece for the cocktail shaker; some were part of an entire matching set of vintage table linens. Cocktail napkins may be either elegant or fun, as you wish. Elegant vintage napkins display fine needlework, handmade lace and embroidery. Deep borders showcase intricate monograms. 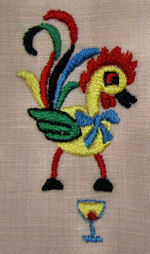 Popular themes include roosters, elephants (preferably pink) and party girls. Sexual puns abound. 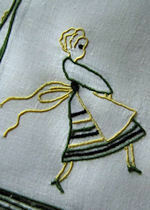 Some are printed or embroidered with "wise" sayings, such as Confucius say, "Girl who is chaste is seldom chased". One old fad has become a new collectible. 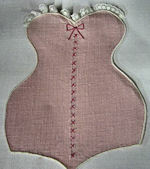 Vintage 'naughty' girl linens with three-dimensional padded bosoms and fannies were made in several forms; none more popular than cocktail napkins. You might choose a specific category of vintage cocktail napkins to collect ... just roosters, just Marghab, just monogrammed, just blue ... or to build a varied collection. However you prefer, you'll have plenty to choose from, a pleasurable, never-ending quest and a most interesting hobby to display. The cocktail napkins described above are just a few of those displayed at Hearts-Desires. Those illustrating this article are available at the time of writing. Selections of vintage & collectible cocktail napkins may be found on Vintage Cocktail Napkins page 1 & Vintage Cocktail Napkins page 2.